Energetically speaking, do all sounds that a dolphin makes cost the same? Dolphins are known to be quite vocal, producing a variety of sounds described as whistles, squawks, barks, quacks, pops, buzzes and clicks. These sounds can be tonal (think whistle) or broadband (think buzz), short or long, or loud or not. Some sounds, such as whistles, are used in social contexts for communication. Other sounds, such as clicks and buzzes, are used for echolocation, a form of active biosonar that is important for hunting fish . Regardless of what type of sound a dolphin makes in its diverse vocal repertoire, sounds are generated in an anatomically unique way compared to other mammals. Most mammals, including humans, make sound in their throats or technically, in the larynx. In contrast, dolphins make sound in their nasal cavity via two sets of structures called the “phonic lips” . All sound production comes at an energetic cost to the signaler . That is, when an animal produces sound, metabolic rate increases a certain amount above baseline or resting (metabolic) rate. Additionally, many vociferous animals, including dolphins and other marine mammals, modify their acoustic signals in noise. That is, they call louder, longer or more often in an attempt to be heard above the background din. Ocean noise levels are rising, particularly in some areas from shipping traffic and other anthropogenic activities and this motivated a series of recent studies to understand the metabolic costs of sound production and vocal modification in dolphins. We recently measured the energetic cost for both social sound and click production in dolphins and determined if these costs increased when the animals increased the loudness or other parameters of their sounds [4,5]. 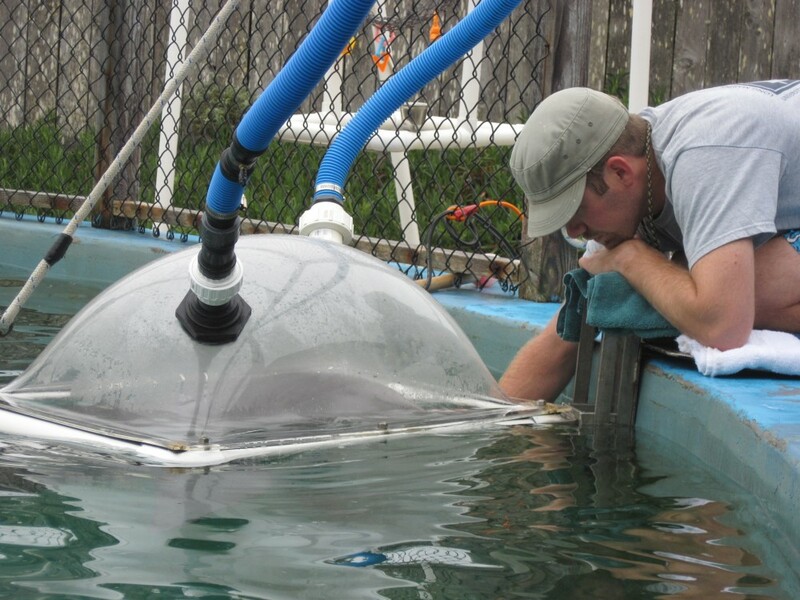 Two bottlenose dolphins were trained to rest and vocalize under a specialized dome which allowed us to measure their metabolic rates while making different kinds of sounds and while resting (Figure 1). The dolphins also wore an underwater microphone (a hydrophone embedded in a suction cup) on their foreheads to keep track of vocal performance during trials. The amount of metabolic energy that the dolphins used increased as the total acoustic energy of the vocal bout increased regardless of the type of sound the dolphin made. The results clearly demonstrate that higher vocal effort results in higher energetic cost to the signaler. Figure 1 – A dolphin participating in a trial to measure metabolic rates during sound production. Trials were conducted in Dr. Terrie Williams’ Mammalian Physiology lab at the University of California Santa Cruz. All procedures were approved by the UC Santa Cruz Institutional Animal Care and Use Committee and conducted under US National Marine Fisheries Service permit No.13602. These recent results allow us to compare metabolic costs of production of different sound types. However, the average total energy content of the sounds produced per trial was different depending on the dolphin subject and whether the dolphins were producing social sounds or clicks. Since metabolic cost is dependent on vocal effort, metabolic cost comparisons across sound types need to be made for equal energy sound production. The relationship between energetic cost and vocal effort for social sounds allowed us to predict metabolic costs of producing these sounds at the same sound energy as in click trials. The results, shown in Figure 2, demonstrate that bottlenose dolphins produce clicks at a very small fraction of the metabolic cost of producing whistles of equal energy. These findings are consistent with empirical observations demonstrating that considerably higher air pressure within the dolphin nasal passage is required to generate whistles compared to clicks . This pressurized air is what powers sound production in dolphins and toothed whales  and mechanistically explains the observed difference in metabolic cost between the different sound types. 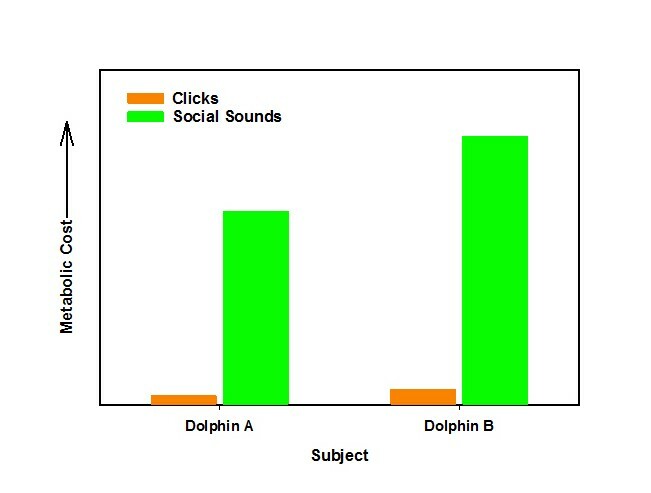 Figure 2 – Metabolic costs of producing social sounds and clicks of equal energy content within a dolphin subject. Differences in metabolic costs of whistling versus clicking have implications for understanding the biological consequences of behavioral responses to ocean noise. Across different sound types, metabolic costs depend on vocal effort. Yet, overall costs of producing clicks are substantially lower than costs of producing whistles. The results reported in this paper demonstrate that the biological consequences of vocal responses to noise can be quite different depending on the behavioral context of the animals affected, as well as the extent of the response. Au, W. W. L. The Sonar of Dolphins, New York: Springer-Verlag. Cranford, T. W., et al., Observation and analysis of sonar signal generation in the bottlenose dolphin (Tursiops truncatus): evidence for two sonar sources. Journal of Experimental Marine Biology and Ecology, 2011. 407: p. 81-96. Ophir, A. G., Schrader, S. B. and Gillooly, J. F., Energetic cost of calling: general constraints and species-specific differences. Journal of Evolutionary Biology, 2010. 23: p. 1564-1569. Noren, D. P., Holt, M. M., Dunkin, R. C. and Williams, T. M. The metabolic cost of communicative sound production in bottlenose dolphins (Tursiops truncatus). Journal of Experimental Biology, 2013. 216: 1624-1629. Holt, M. M., Noren, D. P., Dunkin, R. C. and Williams, T. M. Vocal performance affects metabolic rate in dolphins: implication for animals communicating in noisy environments. Journal of Experimental Biology, 2015. 218: 1647-1654.